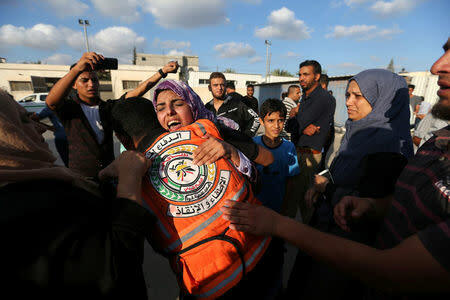 GAZA/JERUSALEM (Reuters) - Palestinian gunmen killed an Israeli soldier along the Gaza border on Friday, said the Israeli military, which launched dozens of strikes into Gaza that killed four Palestinians, including three Hamas fighters. The soldier was the first to be killed on the Gaza front in active duty since a 2014 war between Israel and Hamas, an Israeli army spokesman said. He was on "operational activity" when he and colleagues came under fire, the military said. 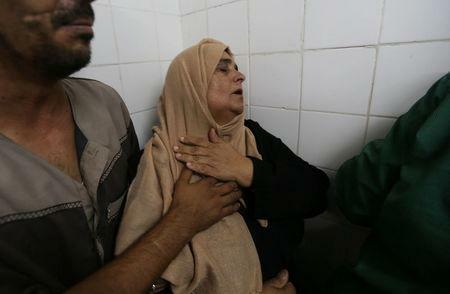 At least four Palestinians were killed in later Israeli strikes, according to Palestinian medical officials. Hamas, the armed Islamist movement which controls Gaza, said three of the dead were its fighters. The fourth was a protester, local residents and medics said. 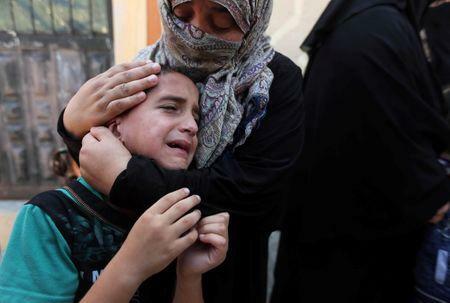 At least 120 Gazans were wounded. Egyptian security officials and a diplomat from another unnamed state were holding contacts with Hamas and Israel in an effort to restore calm and prevent further deterioration, a Palestinian official told Reuters. Gaza was relatively quiet after midnight, residents said. A Palestinian official said: "Egypt has managed to restore calm through talks with the two sides in Israel and in Gaza ... We hope it lasts." Israel said its aircraft and tanks had struck dozens of targets belonging to Hamas and across the Gaza Strip, including a drone warehouse, aerial defense systems and observation posts. "The event that happened today is something that we cannot tolerate and cannot allow to become a routine norm, that's why we retaliated and that's why we continue to target military targets belonging to Hamas," said Lieutenant-Colonel Jonathan Conricus, an Israeli military spokesman. Israeli Prime Minister Benjamin Netanyahu held emergency discussions with cabinet colleagues and military chiefs about the escalation, which follows four months of Palestinian border protests. After dark on Friday, the Israeli military said that Gaza militants had launched three rockets into Israel, of which two were intercepted by its Iron Dome defense system. Israeli Defence Minister Avigdor Lieberman issued a statement after holding a phone conversation with Nickolay Mladenov, the United Nations' envoy to the region. "If Hamas continues with rocket launches, the results will be far more severe than they can imagine. Responsibility for the destruction and for human life will be on Hamas," a statement quoted Lieberman as saying. Mladenov said on Twitter that "Everyone in Gaza needs to step back from the brink. Not next week. Not tomorrow. Right NOW! Those who want to provoke Palestinians and Israelis into another war must not succeed." Palestinian President Mahmoud Abbas, who holds little sway over Hamas, called for international intervention to prevent an escalation of the violence, his office said. Earlier, Hamas defied Lieberman's calls to stop launching incendiary balloons from the coastal enclave and he threatened to order a military offensive to prevent them. Fires caused by kites and helium-filled balloons have ravaged farmland in Israel in recent months. The tactic has become popular during the months-long Gaza border protests known as 'The Great March of Return', in which Israeli security forces have killed more than 140 Palestinians. Palestinians are protesting to demand the right to return to homes and villages they fled or were driven from during the conflict surrounding the creation of the modern state of Israel in 1948. But more recently some Gaza officials said the protests would end if Israel lifted an economic blockade of the Strip. Khalil Al-Hayya, Hamas's deputy chief in Gaza, said the kites would continue to fly. "In the face of Zionist threats, we say the resistance will continue, the marches will continue and its tools will continue to vary and take different forms, including the kites," he said.